FACE CARE FOR MEN "PHYT'S MEN"
For whom is this PHYT’s Men facial treatment? 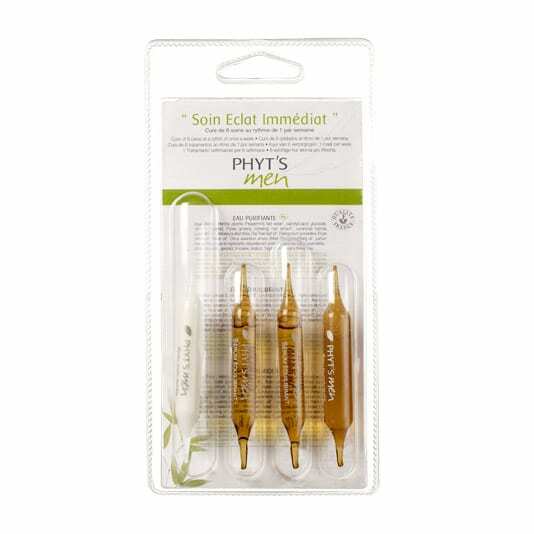 This facial “PHYT’S Men” as its name suggests is suitable for all skin types of Men. Especially Men wanting to clean their skin, remove the blackheads and give an immediate shine. How does a facial treatment, called “PHYT’S Men”, work? The PHYT’s Men facial treatment, also called “Immediate Shine”, is a detoxifying and defatting treatment for all male skins and ideal for scrambled skin (dull complexions). This treatment combines efficiency and relaxation. It begins with a deep cleansing of the skin, use of exfoliating scrub, steam, and extraction of blackheads. Then the mask will help to detoxify the skin and give a sparkle. Lastly, the Anti-Wrinkle Cream for Men, also available for sale, will be applied. What are the results of the men’s facial treatment called PHYT’S Men? Thanks to Ginseng and Aloe Vera, the skin is purified and energized. Your skin is clear and tight. How often do you do this men treatment? It is advisable to do a facial treatment for men on average once a month or in a 4 treatment course (1 treatment per week). What is the price of a PHYT’S Men face treatment? Men’s Face Care 1H- 65€.